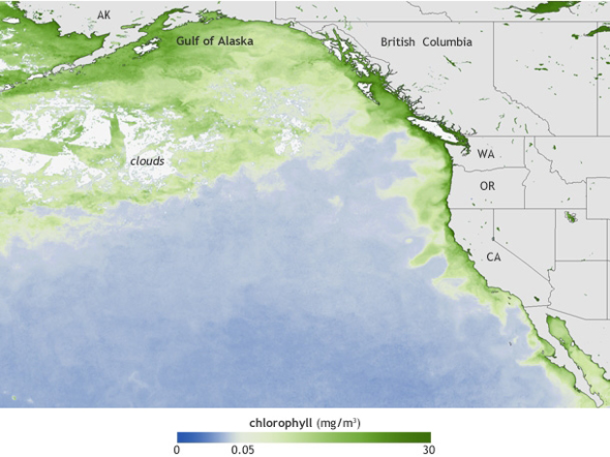 August 2015 – PACIFIC OCEAN – From the air, the Pacific algal bloom doesn’t look like much of a threat: a wispy, brownish stream, snaking up along the West Coast. But it’s causing amnesia in birds, deadly seizures in sea lions, and a crippling decline in the West Coast shellfish industry. Here’s what you need to know about it, from what this bloom has to do with the drought to why these toxins could be a real threat to the homeless. What’s causing it? 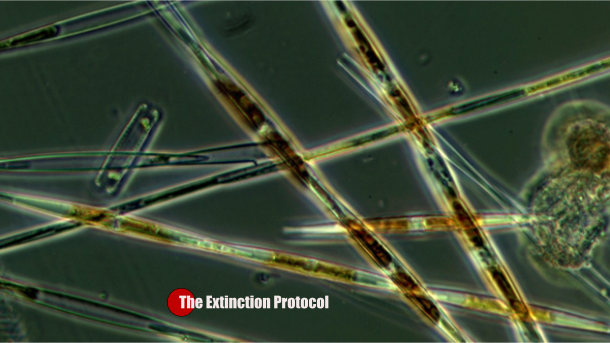 The culprits are single-celled, plant-like organisms called pseudo-nitzschia, a subset of the thousands of species of algae that produce more than 50 percent of the world’s oxygen through photosynthesis. They’re a hardy variety usually found in cool, shallow oceans, where they survive on light and dissolved nutrients, including silcates, nitrates, and phosphates. “They’re sort of like the dandelions of the sea,” says Vera Trainer, who manages the Marine Biotoxin Program at the Northwest Fisheries Science Center in Seattle. “They’re always there in some low numbers, just waiting for nutrients to be resupplied to the ocean’s surface.” In most years, blooms in the eastern Pacific are contained near “hot spots” that dot the West Coast—relatively shallow and sheltered places like California’s Monterey Bay or the Channel Islands. They usually flare up in April or May as trade winds cycle nutrient-rich waters from offshore depths to the coast in a process called “upwelling,” but they fade after only a few weeks. The jury’s still out, but scientists are beginning to get a clearer idea. These past few years have been “incredibly weird” in the northeast Pacific, says Nate Mantua, a research scientist at the National Oceanic and Atmospheric Administration’s Southwest Fisheries Science Center in Santa Cruz. He points to the same “ridiculously resilient ridge” of high pressure that’s been causing the historic drought in the western United States: This pressure also resulted in a pool of exceptionally warm water in the Pacific (known as “the blob”), with little weather to disperse it. Those conditions, along with prevailing winds and colder currents that ferry nutrients back to the coast, are supplying the algae with a seemingly endless feast. This entry was posted in Acquatic Ecosystem crash, Black Swan Event, Civilizations unraveling, Climate unraveling, Earth Changes, Earth Watch, Ecology overturn, Environmental Threat, Food chain unraveling, Marine animal strandings, Mass animal deaths, Potential Earthchange hotspot, Prophecies referenced, Red Tide, Time - Event Acceleration. Bookmark the permalink. This is significant and alarming. Has anyone done any studies in regards to the timing of this unique bloom appearance and the Fukishima events? Seems there is at least a timing co-relation? Radiation has been brought up by one or two scientists. whale remains were sent to a lab months ago to test for radiation. The lab is backed up and no results are in. Fukushima is the cause of west coast die offs. The Pacific Ocean is dead. Brings tears to my eyes to lose this beautiful Eco System. please keep us updated on how fertilizer and sewage etc contributes to this algae. Only God can help us now. We have destroyed the earth. Destroyed the sea and the waters. Human’s destroy everything they touch. Dear jenny . it’s is not god who can help us. We can only help ourselves by getting rid of the parasatic elite creating these disasters on purpose en for profit to clear the earth of all humans but the serfs for the elite. Stop compying vote with your dollars and let them know your not buying their products anymore. I had the same question, I would also like to know, what kind of threats there are for humans if we eat fish or shellfish that is contaminated?. Eating contaminated fish with radiation for example will not be seen, smelt or tasted, its an invisible killer. It will affect you by destroying your internal organs or give you cancer. Its a killer anyway you look at it. Check into the rise in cancer levels, this is not stress, its contamination, but no one will take the blame and no one will take the initiative in moving toward the cessation of eating fish to save human life. The day is fast approaching when ocean fronts / beaches will be fenced off because of the dangers of both the toxic water itself (man made)and the fish within. Even playing on the sand will be classified as dangerous because of the tidal wash up. So stop eating anything from the ocean now, its already contaminated, we just are not being told because the ‘fishing industry’ is a multi-trillion dollar deal, as is tourism, so they are shutting up and would rather see huge cancer levels rise, than our oceans fenced off. Money to them, is a greater loss than human life. Red tide. It’s algae boom. Algae is basically green. Then why the tide with algae has the red color? The plants are green because the leaves contain chlorophyll. (I know there are more colors of them also) If the leaves are tender then also the leaves of roses are reddish and becomes green when they grow. In the same way when the leaves get older or chlorophyll gets damaged by viral attack some leaves changes color from green to red. When the green leaf changes to red or yellow we cannot change it to green. The leaf also cannot create food for plant. Means if the algae is getting red then it will not absorb the sun rays and CO2 to generate oxygen. So finally the dissolved oxygen in water is getting reduced. This is the condition which was always observed in all mass fish kills. If it is the toxin which is generated by the algae because of the boom or over growth of toxin producing algae then oxygen % in sea or river should increase with the algae boom.